We speak from Urbino, a charming medieval city built on top of a hill in the region of Marche, in central Italy. 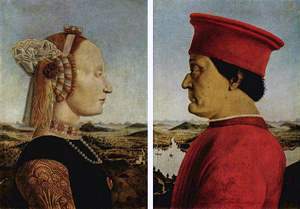 In the second half of the 15th century, Urbino became an important artistic and cultural center, especially under the rule of duke Federico da Montefeltro, a lover of the arts who brought to the city great artists of that time, such as Donato Bramante, Leon Battista Alberti and Piero della Francesca – author of this famous portrait of the duke. In 1483, few months after duke Federico’s death, came to the world he who would become Urbino’s most famous citizen, the great painter and architect Raphael Sanzio, simply known as Raphael, shown here in his famous self-portrait. Urbino’s cultural vitality played a decisive role in spurring young Raphael’s precocity, himself the son of another less famous painter. But his talent would soon lead him beyond the city, to higher flights. At the age of seventeen, Raphael was living in Perugia, capital city of neighboring Umbria region. There, he worked under Perugino, a renowned master who greatly influenced the young painter’s technical development. After turning twenty-one, Raphael moved to Florence, where he became acquainted with the works of two other great masters of the Italian Renaissance: Leonardo da Vinci, who by that time already amazed the world with his Mona Lisa, and Michelangelo, who had already finished his monumental sculpture of David, which can still be seen in Florence. 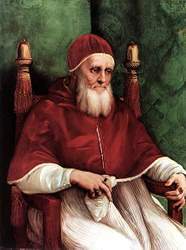 In 1508 Raphael was called by pope Julius II to Rome, where he would spend the last twelve years of his short life. His first task there was to paint a series of frescoes in three papal chambers of the Vatican. 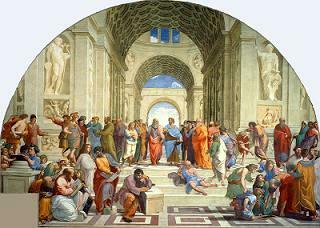 The “School of Athens” fresco, in one of those chambers, portrays a debate between Greek philosophers Plato and Aristotle, and is perhaps Raphael’s most famous work – certainly influenced by the painting that Michelangelo was doing at the same time on the ceiling of the Sistine Chapel. The next pope, Leo X, commissioned him to design grand works of tapestry that were supposed to cover the side walls of the Sistine Chapel. In those sketches, Raphael portrayed with great artistic feeling biblical scenes from the New Testament, such as the miraculous draught of fishes and Paul’s preaching to the Athenians on Mars’ Hill (Areopagus). Raphael was, in addition, a master portraitist. One of his most famous portraits can be seen at the Ducal Palace of Urbino, and is known as “The Mute Woman”. The identity of that young lady, painted with such perfection and refinement, is still uncertain, but she was probably part of the Florentine nobility, or, perhaps, one of many women with whom Raphael became involved, even though he never married. 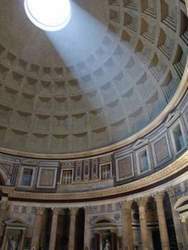 In 1514, Raphael was designated to work on the construction of St. Peter’s Basilica, in Rome, as an assistant to great architect Donato Bramante, who, by the way, was his fellow citizen – born two miles away from Urbino – and the one who appointed Raphael’s name to pope Julius II. After Bramante’s death, in that same year, Raphael became responsible for the whole work. It is noteworthy that the construction of St. Peter’s Basilica – replacing the old building, from the 4th century AD – was one of the catalysts of the Protestant Reformation. One of the main goals of Luther’s 95 theses, made public in 1517, was to oppose the sale of indulgences, which, in turn, was part of a fund-raising campaign for the construction of the Basilica. But that’s another story. Raphael didn’t live to see the unfolding of the controversy, for he died three years later, in 1520, at the age of 37, and was buried with great honors in the Pantheon, in Rome. We don’t know much about Raphael’s personal faith, but he undoubtedly left behind an important work, in which he depicted, with great depth, both sacred and profane themes. His creativity and originality have influenced several generations of artists, such as the adepts of the so-called “mannerism”, in the late 16th century, who sought to paint “after the manner of” Raphael, Michelangelo and Leonardo.